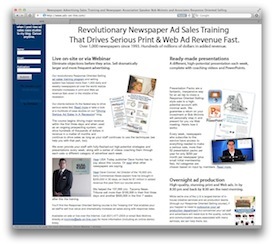 Driving Serious Newspaper Ad Sales: Looking to drive ad sales? Try a thrift shop! Looking to drive ad sales? Try a thrift shop! initially) on what's in it for the customer. Need to drum up revenue? There's money hidden in every one of your territories. You just need to know where to look for it. Here's a perfect example. This thrift shop in Arizona was only running sporadically, but when presented with the right sales techniques and an effective ad strategy, they signed a huge ad contract on the spot. I know what you're thinking. A thrift shop? But they're non-profit. And a charity. And isn't their target market people without a lot of money? And don't these places have a small budget? Probably. 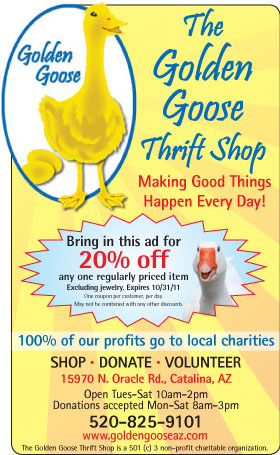 But in November, we helped a newspaper client identify this thrift shop as a perfect prospect. They sell many high-ticket, upscale items donated by area residents and compete with the chain stores that sell similar items. And while the money generated by thrift shops ultimately goes to lower income families, their target customers have serious incomes. We first talked to the store's manager, who was no more interested in spending additional money with the newspaper than any of your accounts in this economy. But that doesn't mean they shouldn't be spending more money, and remember, your job is to help them become profitable, not work within what's often an arbitrary budget based on a current or past, less-than-effective ad strategy. So after getting the standard information about the business' products, target customers, and competition, we went about building an ad that would work for the prospective advertiser. Looking at her previous ads, we saw that while the ads were creative, there was significant room for improvement. Like many categories, there are people who have figured out how to sell items like these. So we looked at the department stores, and it was pretty obvious what we needed to do. And it meshed well with what the thrift store manager said as well. They were trying to target people interested in really nice items at a substantial discount and wanted to buy from a place that seemed to have a great selection, so they wouldn't be wasting their time. 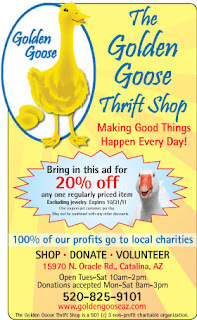 The thrift store manager also knew that their target customers want the money they spend to help charity, but since they were competing with so many other charities on that issue, the idea was to appeal to something they already wanted (great items at great prices) and push them over the fence with the idea that their money will also go to a wonderful cause. So those are the things we based the ad on. We used a graphic at the top to get the target customer's attention (hopefully something similar to what they were in the market for) and then hit them with a headline that would keep them reading the ad. We then put enough items in the ad to convince readers that the shop has great quality, price, and selection, and wrapped it up by including information on the charity to which the proceeds go. Once the manager had a new perspective on how advertising worked, we simply took out the spec ad and explained why it was an effective ad. We also explained that they needed to run larger ads to compete with the big department stores and, really, they only needed one response to be making money from donated goods. The logic made sense and the manager signed a 13x contract (including Web) on the spot for an ad easily twice the size. The point here is, try not to pay attention to how much money the prospect says they have or appears to have. Ask yourself, do they need to run larger to succeed? And what return on investment do they need to make a profit? Many times, the ad can more than pay for itself with just a response or two and you can find revenue in what initially seemed to be an unlikely place. Focus on selling response, not space, and the money will follow.